Who would have thought glass could be so interesting? Not me, that’s for sure. When we set out to visit the World of Glass on a dreary Saturday afternoon I was not expecting too much. Spurred on by a website discount voucher for cheap entrance, we decided to give it a try. 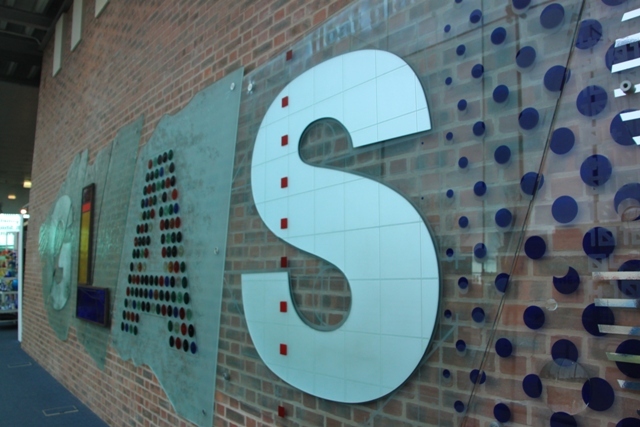 This place is part museum and part visitor centre both devoted to all things glass. 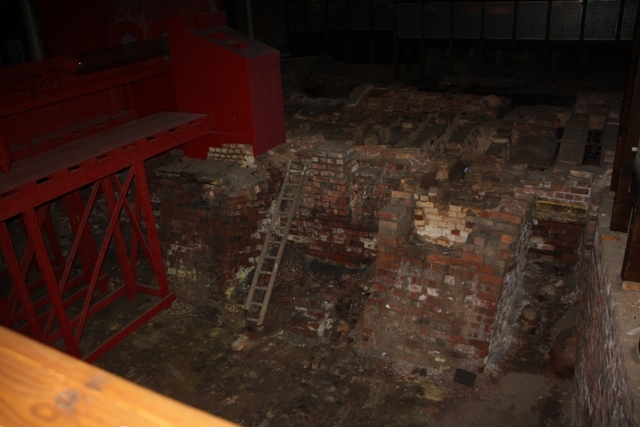 Based in the Merseyside town of St Helens, it is the home of a major glass manufacturer and glass making has been done here since the early 19th century. 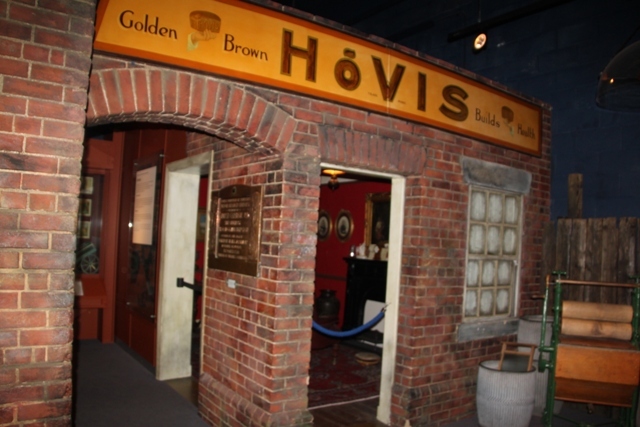 The entrance is pretty quirky – a reproduction Cone House – very “echoey” – cue lots of shouting and weird noises from our the males in our family. Just inside the entrance is a huge Venetian glass chandelier – regarded as an iconic piece of public art, it weighs 2 tonnes and they had to have the ceiling strengthened to be able to hold it. 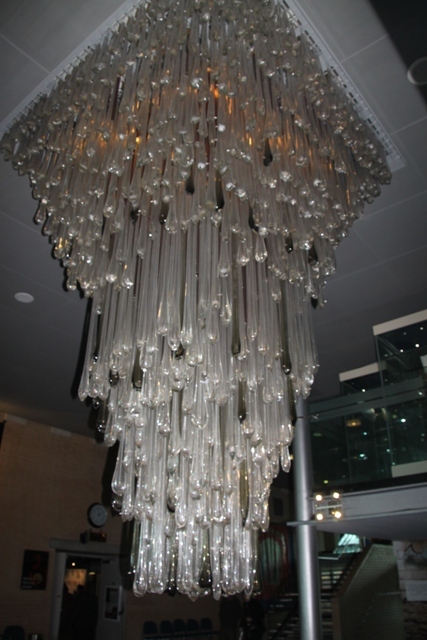 The chandelier originally hung in Manchester Airport from the 1960’s to 2003. It was one of 4 identical chandeliers which graced the departure hall until a major renovation was carried out. This one was restored and brought here so everyone can take in the glory of the 1,300 droplets of clear and coloured lead glass. It is spectacular close up. 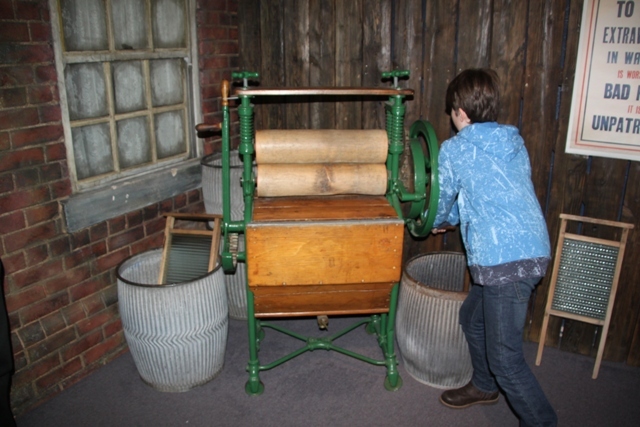 The museum part was a little recreation of a Victorian town, nicely done with loads to see, Son enjoyed this area a lot. 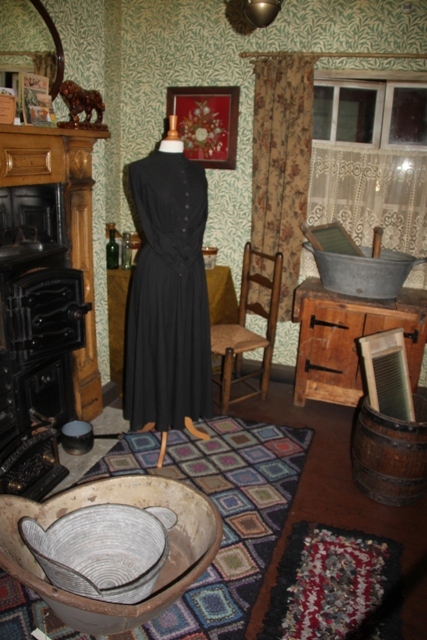 They had old houses and a school-room to peek inside with audio playing about life in the town back then. Highlight of the day though was watching the resident glassblower in action. A purpose built area with seats and great views all around, we watched as molten glass from the furnace was transformed into a variety of designs. The glassblower’s commentary was fascinating, he was every eloquent and made it all look so easy. Great fun and fabulous to see this ancient craft in action using traditional tools and methods. We all loved it. Glassblowing done, we headed next door for a special effects film about glass – so much better than it sounds and actually quite thought provoking. 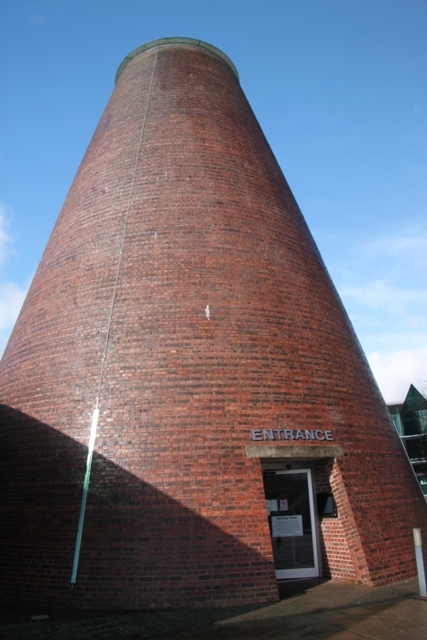 We crossed a glass bridge (what else) over a canal to reach the Victorian cone house – a 19th century glass making furnace. 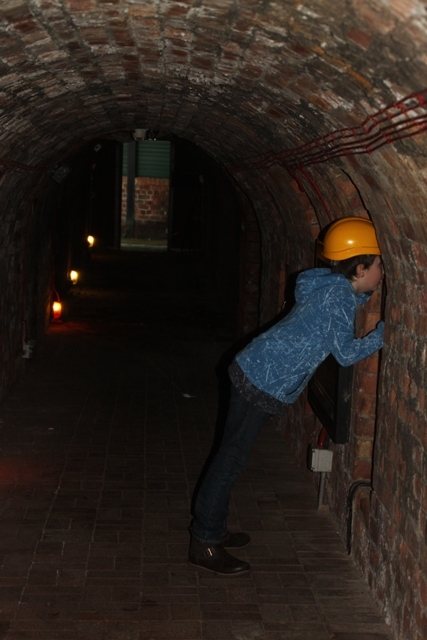 Mainly ruins, you can don attractive yellow hard hats and explore the underground tunnels beneath the old furnace. Back over the tunnel again we found lot of amazing glass “stuff” for sale in the gallery – we left with a cute glass duck. 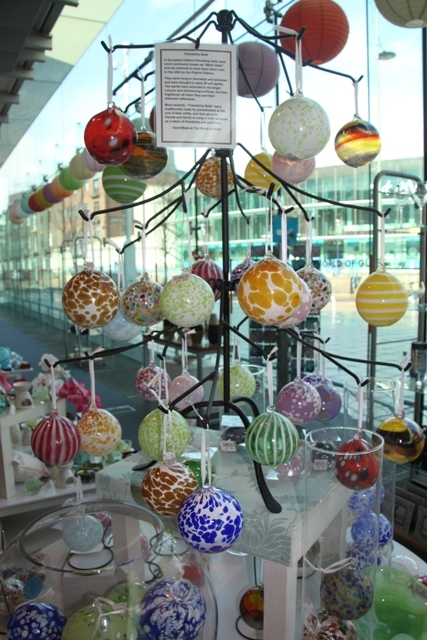 I loved these baubles too – “friendship baubles” apparently it was traditional for glassblowers to make them at the end of their shift and give to each other. World of Glass exceeded our expectations. It’s worth coming just to see the glassblowing in action, but there are so many other bits and pieces to do, it’s quirky and different. Definitely a fun day out, definitely recommended. Such petty pictures!and I am in lust with that chandelier. Thank you – I know it’s something else isn’t it!! 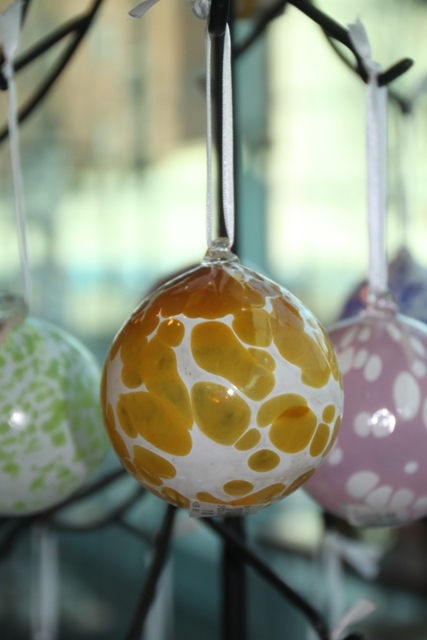 Love the photo of the glass baubles–very pretty! Thank you Jennifer! They are gorgeous baubles, I like the history behind them too, makes them more special. 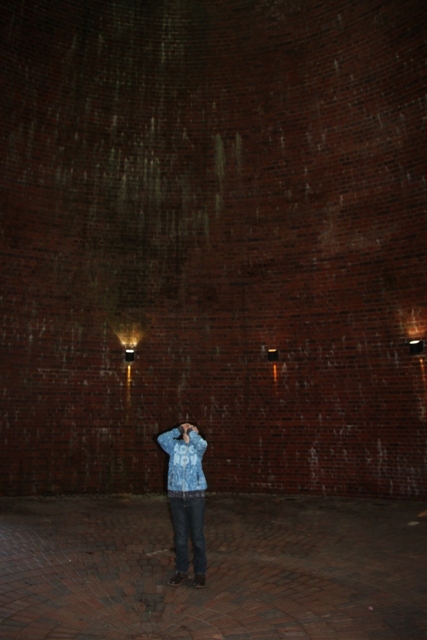 Your writing makes me wish I had visited this place before we left Britain. I love glass. The friendship baubles are lovely. They remind me of a blown glass witch’s ball that I have. Your photos have me coveting those baubles. It’s a bit off the beaten track and didn’t seem to be very popular but we enjoyed it here such a lot. The baubles are gorgeous – I was tempted to buy one, didn’t and now wish that I had done! Might just have to go back sometime for that…..
Nice post. Should I make a visit while I’m still in London? 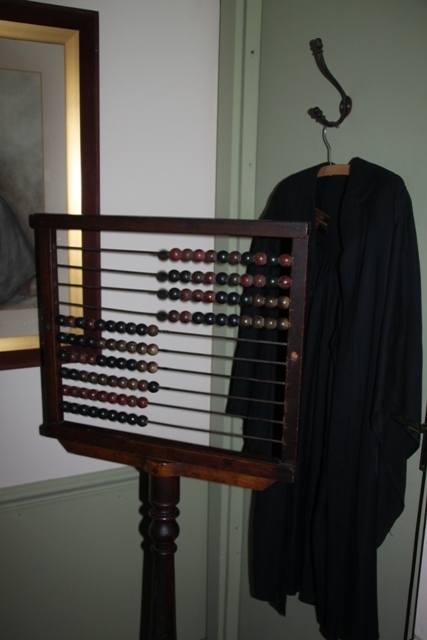 We LOVE museums like this – quirky and off the beaten path. I shared this with the kids and they all want to go! Thanks for sharing. Yes, we’re the same Anna and it’s something a bit different. Not everyone’s thing but we enjoyed it a lot. I have to say it’s not the most obvious one to me, either. Sounds like you all enjoyed it, though. 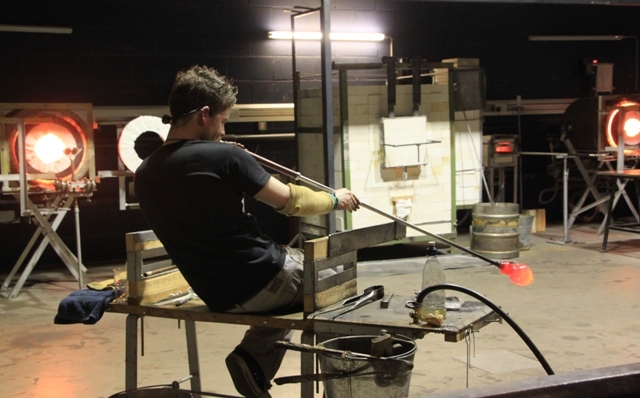 Definitely the glass blowing would be the highlight for us I think. Yes, definitely off the beaten track but interesting and different. Not everyone’s cup of tea, but we really enjoyed it. The glassblower was top notch!